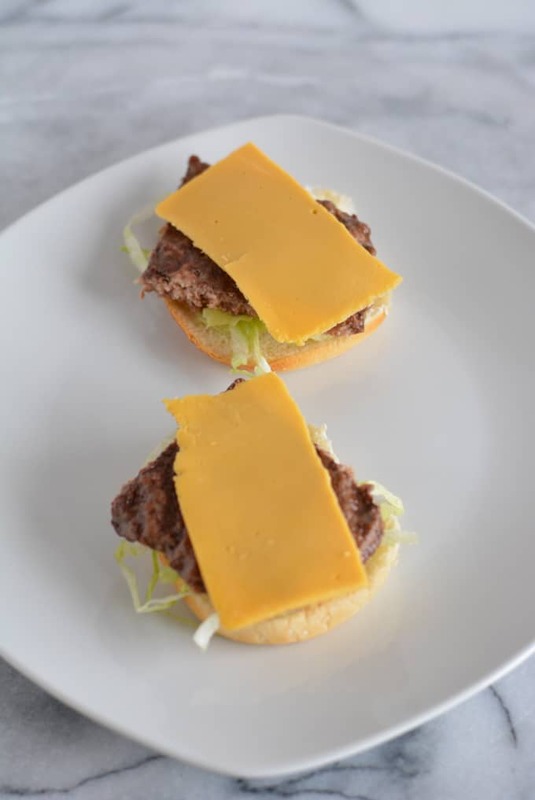 Mini big mac burgers made right at home will save you money for sure. 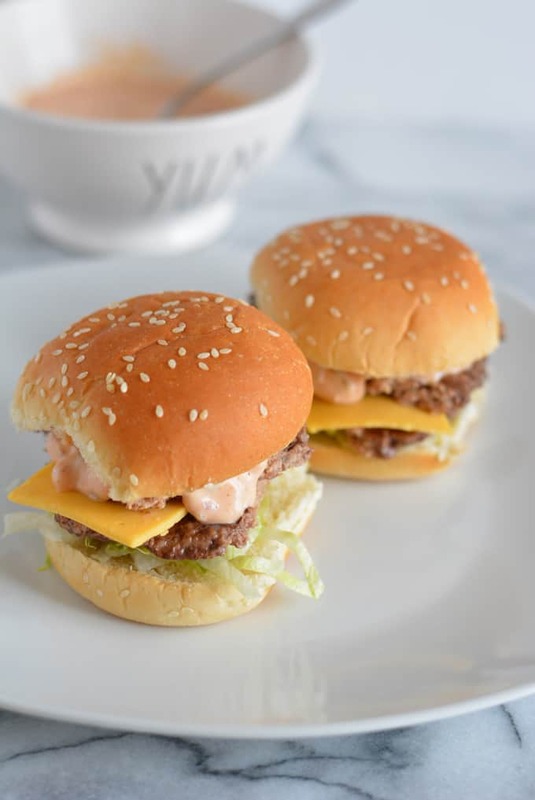 Homemade copycat big mac sliders are the perfect mini burgers that kids (and adults) will love. These burgers are cuddled inside a sesame seed bun and topped with a copycat version of McDonald’s special sauce all made from ingredients you probably already have! Follow my tips for the perfect slider. I know what you’re thinking, how does a dietitian know what a Big Mac tastes like? I have eaten at McDonald’s. Dietitian’s who pretend that haven’t are full of crap! They may not have set foot in a McDonald’s for years, but I bet even as a kid they ate at least one McDonald’s burger! How can I help my clients who occasionally run into the golden arches pick the better option if I don’t know what’s on the menu? Right? My 40ish-year-old intestines cannot handle McDonald’s, so I do refuse to eat there now, but as a kid, we went there every once in a while. My teenager, who ends up at the local McDonald’s after he and his friend’s workout at the gym (I know it makes no sense to me either) is learning that their food (or what they call food) isn’t great! But, he does like the taste of their Big Macs! I thought if I can mimic the taste at home he would stop going there altogether. I’m not stupid. I don’t think he’s going to stop going there, but a girl can try. TJ did approve of these Big Mac Sliders, thank goodness! 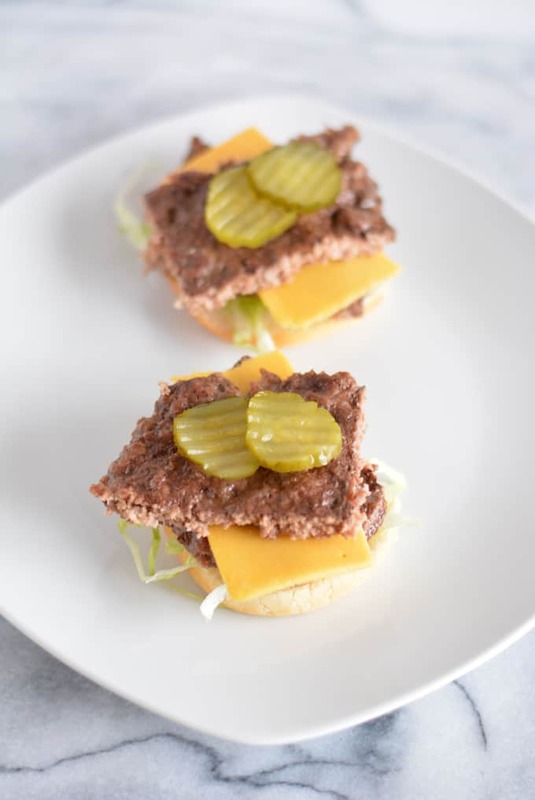 To make any sliders, start with lean ground beef (preferably grass fed). You can use ground turkey if you wish. Spray the pan with a thin coating of olive oil spray, just so the meat doesn’t stick! 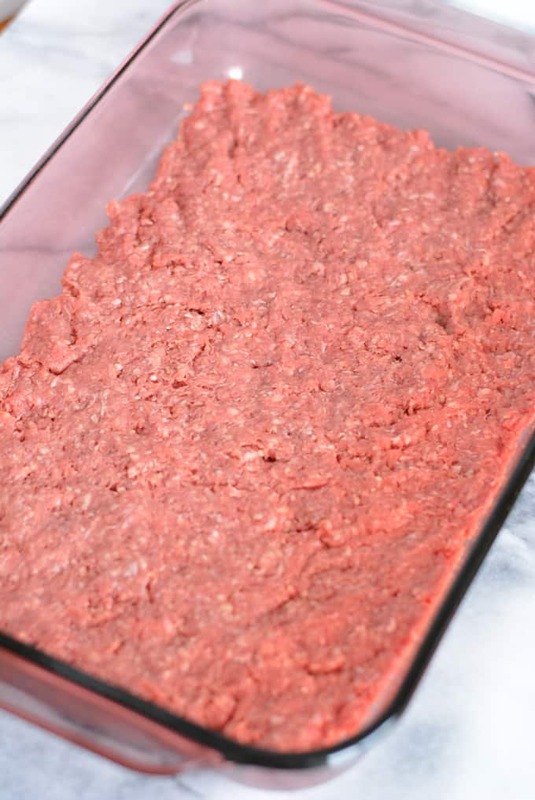 Spread 1 pound of ground beef evenly in a 13×9 inch baking pan. Add beef to the bun of your choice. Spread out the ground beef. Divide the beef how every you wish. I just estimate and divide the beef evenly into squares. To make an authentic Big Mac you need to use the less desired iceberg lettuce. You can use any lettuce you want, but my son will only accept this slider if it looks and tastes authentic! Instead of buying a whole head of iceberg lettuce I cheat and buy a small bag of shredded lettuce. I’m not really sure what type of cheese McDonald’s uses. I tried to sing the Big Mac song to see if they name the cheese, but they don’t. You know the song “Two all beef patties, special sauce, lettuce, cheese, pickles, onions, on a sesame seed bun”. If you grew up in the 70’s and 80’s you heard it! Haha, I couldn’t resist, here it is!! I tried both cheddar and orange American. They both taste like they belong. I’m sure you get processed orange American on the real Big Mac. You have to add a second burger patty to be authentic, but you really don’t need to. You can save some calories that way. The first time I made these I forgot to buy pickles. My hubby and son ran out to buy a jar because the sandwich just wouldn’t be the same without them! OMG! Now for the special sauce! What is the special sauce? There are tons of recipes online. I took parts of all of them and made the sauce from ingredients that I already had in the house. A few recipes used a tablespoon or 2 of French dressing. I don’t usually use French dressing and didn’t want to buy a whole bottle for this. That would have been a waste! My son insisted on tasting the sauce before he ate the Big Mac sliders because if the sauce wasn’t right there was no point in eating the burger! Yes, I love him, but what a pain in the tush! The following are affiliate links. I participate in the Amazon Services LLC Associates Program, an affiliate advertising program. This program allows me to earn fees by linking to Amazon.com and affiliates site to help me continue to run Nourished Simply! A 13×9 inch pan is perfect to spread out the slider meat. I have this glass pan. I love the lid because I can store leftovers for other recipes right in the pan. 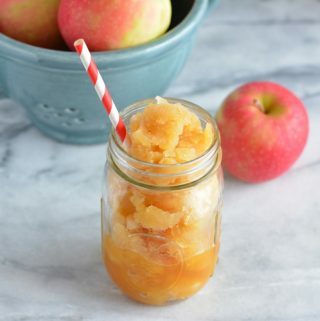 If you enjoy this recipe please give me 5 stars!!! 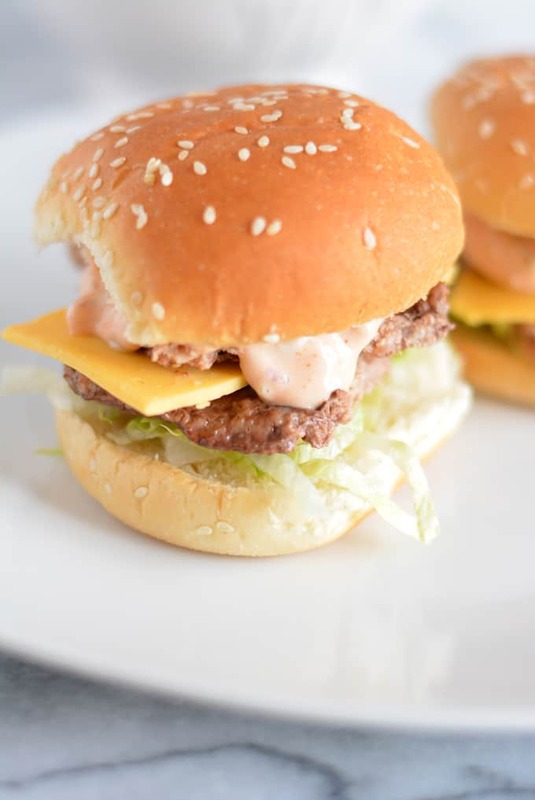 A copycat version of the classic McDonald's Big Mac made with fresh ingredients. Lean ground beef cuddled inside a sesame seed bun and topped with homemade McDonald's special sauce. Spray the bottom of a 13x9 inch baking pan with olive oil spray. Spread out the ground beef evenly on the bottom of the prepared baking pan. 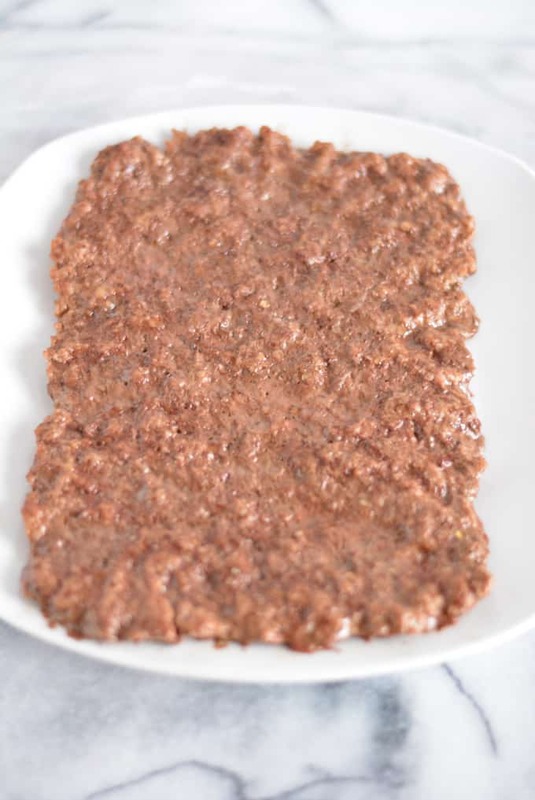 Bake ground beef in the oven for 20 minutes or until the temperature is 160 degrees F.
While beef is cooking prepare the sauce: place all ingredients in a small bowl and mix until combined. When beef is cooked removed from the pan and cut into 12 equal squares. 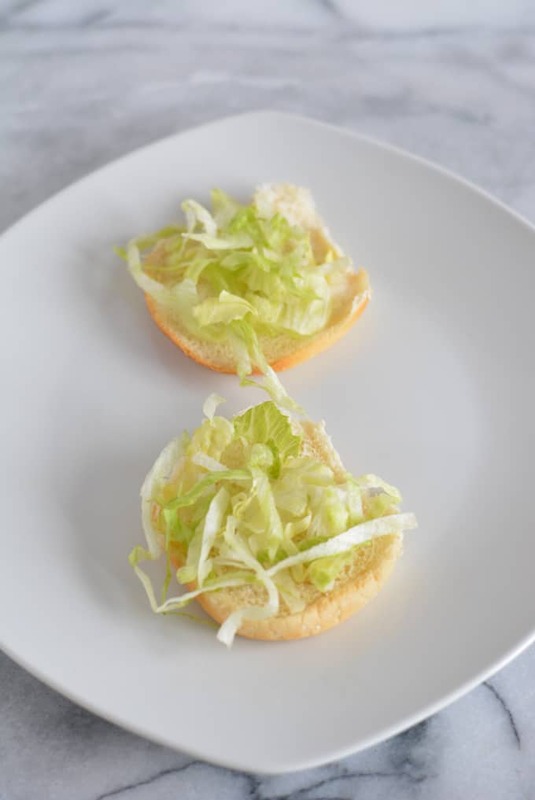 Place lettuce on the bottom of a slider bun. Top with one beef patty. Next, add cheese (1/2 of one slice is good). Top cheese with another patty and then pickles. 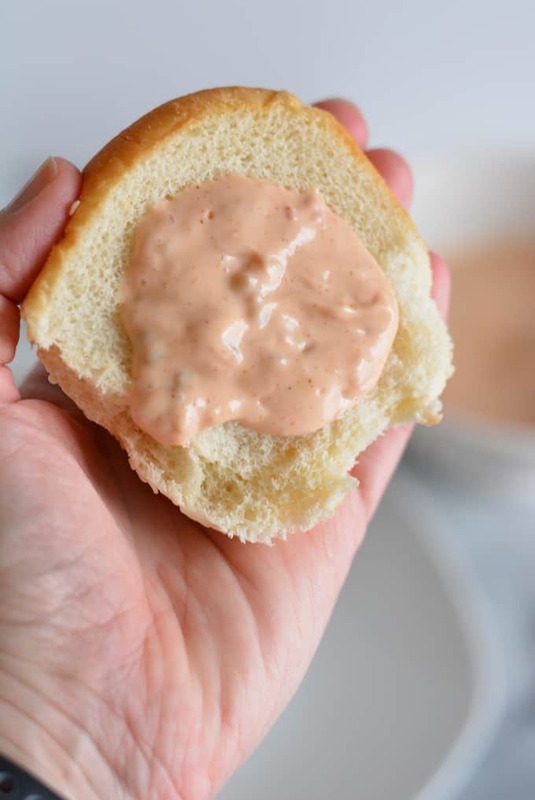 Spread sauce on top of the slider bun and add a pinch of onion. If you want to warm the burgers, which I recommend, wrap them in foil either individually or all together in a baking pan. Place the burger back into the oven until the cheese melts for about 5-10 minutes. Nutrition information for the sauce is posted after the recipe card. Other items you might need!